If you’re like me, which you probably aren’t because I’m strange, but if you ARE, you’ve heard of fishing but haven’t tried it. You’ve probably seen screenshots like this in Discord from guild mates. You’ve probably even bought the gear because someone drug you to the NPC, but may or may not have equipped it and STILL haven’t seen a fish! 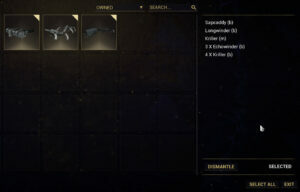 Recently I saw that I needed fish parts to build the K-drive of my dreams that I am WAY too cheap to spend plat on, so Imma goin’ fishin’! I decided to bite the bullet and figure this crap out finally. Here’s how I did it, and it might just work for you. So to start with, you’re going to want to talk to The Business. He’s the dude rocking a radiator like a boss. Next up, you’re going to have to spend some standing to buy STUFF! 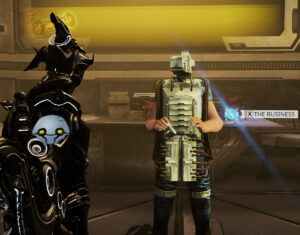 Fortunately if you’ve unlocked Orb Vallis you should have a little standing. If you need more just head outside and talk to the bounty guy, do some missions and you’ll be good to go. 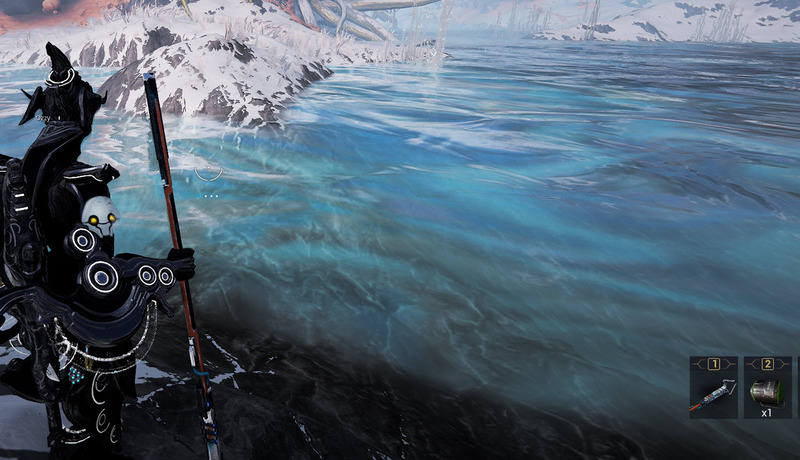 You’re going to want to buy at least the Schockprod Fishing Spear. If you haven’t done any fishing before, try picking up the bait. It’ll actually bring the fish in quicker so you can see what you’re trying to hit. That helps a bunch. Now that you have your new shiny fishing… spear… thingy… Don’t forget to hit your arsenal in the escape menu. You don’t even have to go back to your ship you can change your loadout right there in Fortuna just as if you were in a relay or in the Dojo. Once in that menu go on down to equipment and toss the speargun in the wheel there. The bait doesn’t need to be equipped, just the speargun. 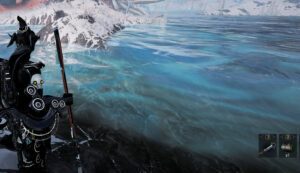 With your shiny new fishing spear equipped it’s time to pack those thermal underpants and head out in the the bitter cold of Orb Vallis to sit next to a somehow not frozen pond of water spearing robotic fish. I kid you not, that IS what you’ll be doing. Bear in mind that it doesn’t make it any less FUN! Now sidle on up to the water. You’ll want to get really close or almost toes deep in before you hit number 2. 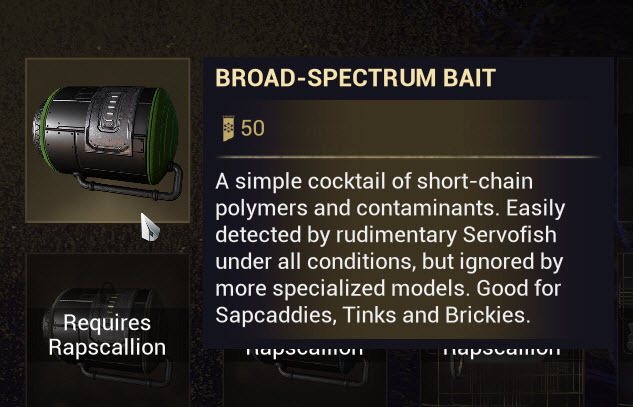 That’s the keybind for your Broad-Spectrum Bait. Check out the image below in the bottom right hand corner. 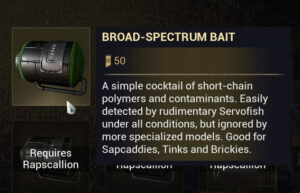 Keep in mind that it is consumed on use so it is a chunk of rep gone but if you’re doing it all of once to just see where the fish are, OR you’re probably trying for a greater range of fish, it’s worth it. Now just look out in the water and start looking for something wriggling. It shouldn’t take too long really. If you have your spear out you’ll even see a little fishy hit bar that’ll make it easier to target the lil bastages. 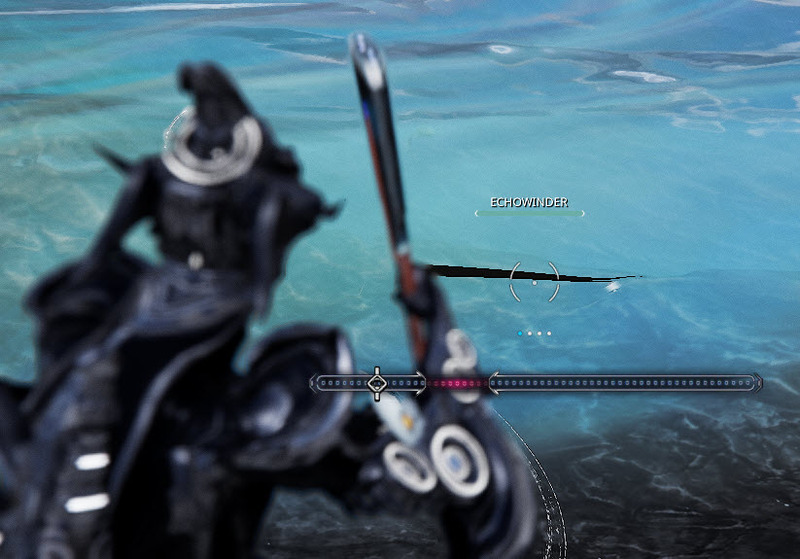 Just hover over the fish until your reticle brings up that fishy hit bar. 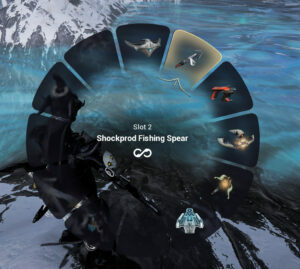 Then click with the left mouse button to fire the speargun and snag that fish. It helps to wait until they’re just chilling out somewhere for a moment otherwise you’ll have to lead them a bit. You can also use your right mouse button to zoom in on the water. This’ll bring them a bit more into focus and help you hit ’em. Once you’ve got one on the line just wait until the little hover bar in the center there lands in the red. Fortunately you just have to click the left mouse button one time when it gets there. Saves out on a lot of time, energy and keyboards. I’m looking at you BDO. The music Warframe plays when you DO catch a fish is SO AWESOME that’s worth every catch. At least I think so, but see the top of this post if you have questions. 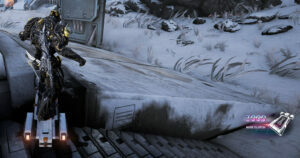 Now, rinse and repeat until you feel like you’ve thinned the schools enough for one day and head back on into Fortuna. So you’ve managed to get these fish, but why would you even bother going through this much effort? 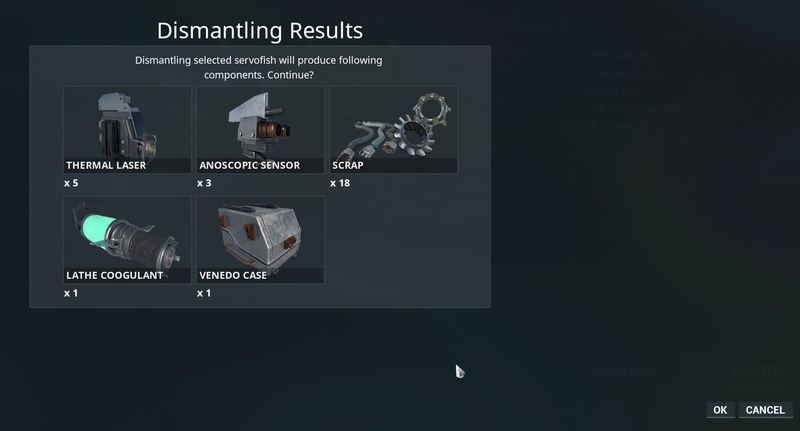 Well if you want to build either the fancy new warframe or you want to build a better K-drive, you can sacrifice your new fishy friends to get at their sweet, sweet, components. 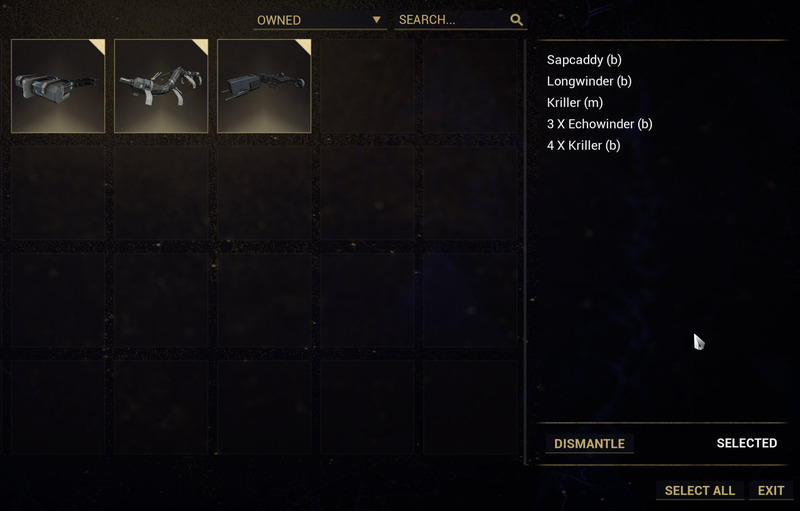 To do that you’ll want to head on back to The Business and this time you’re going to want to ask him to put his back into it for a change and disassemble those fish for you by selecting Dismantle Servofish. 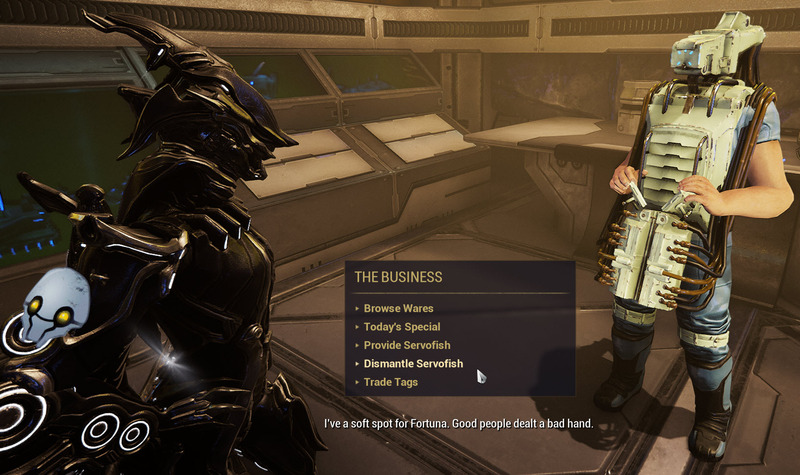 He’ll pop up with this handy menu where you can select which fishies you’re willing to part with, either some or all, you know whatever goes. 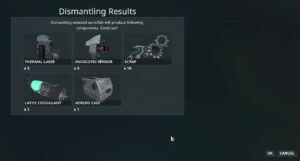 Just select and hit dismantle. Once that’s done you’ll see what your part haul is for you fishing adventures. Most of these items are used to build the things you need to build, TO build the things you WANT to build. What’s an MMO without steps before steps? 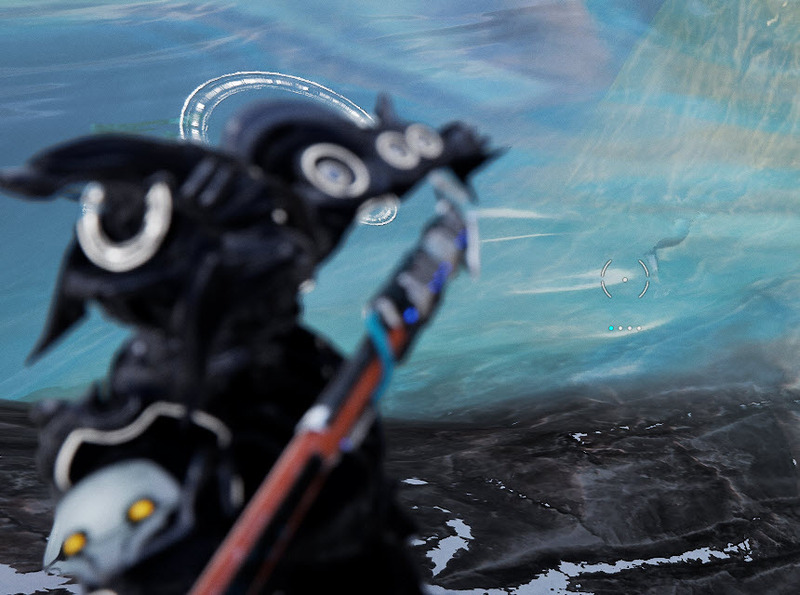 Now you’re well on your way to getting the fishtacular components you’ll need to craft the random crap you’ll be crafting here in the belly of Fortuna. Well at least the start of it, you’ll find more of the goods roaming the frozen hills of Orb Vallis. Now on to getting rep to build that sweet, sweet, new K-drive that you’ll be able to trick out and well… you know, do tricks ON. Not to mention the cool mods that’ll let you rip through mobs as you shred your way across the map! Hey a gal’s gotta have goals. A bigger and better K-drive is mine! Until next time, remember your f-budget and enjoy stabby stabbin’ them fishies!